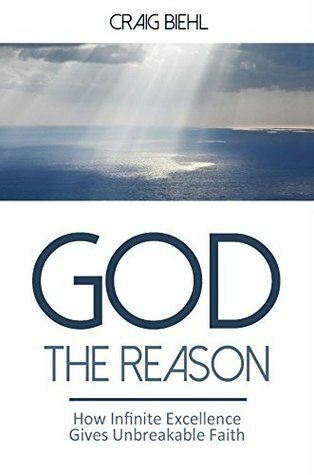 God The Reason is a fantastic resource for Christians looking to both bolster their faith and to firmly and accurately defend that faith when challenged. I really enjoyed the author’s unique approach to this vitally important subject, and while I did find the book to be more “academic” than other more basic apologetics books I’ve read in the past (certainly not a “fast and easy read” for casual readers) it is nevertheless a powerfully compelling book that offers readers a well-presented, exceptionally thorough, and profoundly logical approach to a defense of the foundations of the Christian faith. A very worthwhile read, and would make an excellent addition to any Christian’s library. Highly recommended! Two years after graduating from college, Craig’s life was turned right-side up from a view of the infinite excellence of Jesus Christ as revealed in Scripture. Decades later he writes on various theological topics, including apologetics, the theology of Jonathan Edwards, the majesty and beauty of God, and the Christian life. He recently launched Pilgrim’s Rock to develop home school curriculum to nurture unbreakable faith in students about to enter college and parents worried about sending them there. Additional audio, video, and written material will explain the infinite excellence of the Triune God, justification and new life, the infinite merit of Christ, the Gospel, and other relevant biblical topics. Craig received his AB from UC Berkeley, MBA from UCLA, ThM from Dallas Theological Seminary, and PhD in Systematic Theology from Westminster Theological Seminary. He is happy to be redeemed in Christ, to whom he owes all things and apart from whom he is nothing.